Essentially there was no Monday Night Raw other than the fact that they replayed the Triple Threat Match and the rumble itself on Raw. 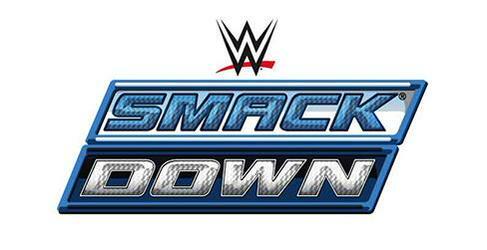 So, Smackdown was live from Hartford, CT which was supposed to be sight of Raw. The COO Triple H kicked off the show and he pumped up the crowd telling them that no one tells the WWE to postpone Raw and then he told the crowd that everyone told them they would never reach a million subscribers, but they did. 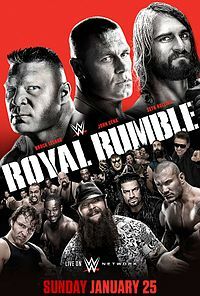 The he talked about the Royal Rumble and how Seth proved that he was the future, John Cena proved his was the past, and that Brock Lesnar was the Beast Incarnate. He kept claiming that there was some controversy in the Rumble match itself and that unlike the NFL he deals with the controversy (He made an awesome joke about the NFL and balls). 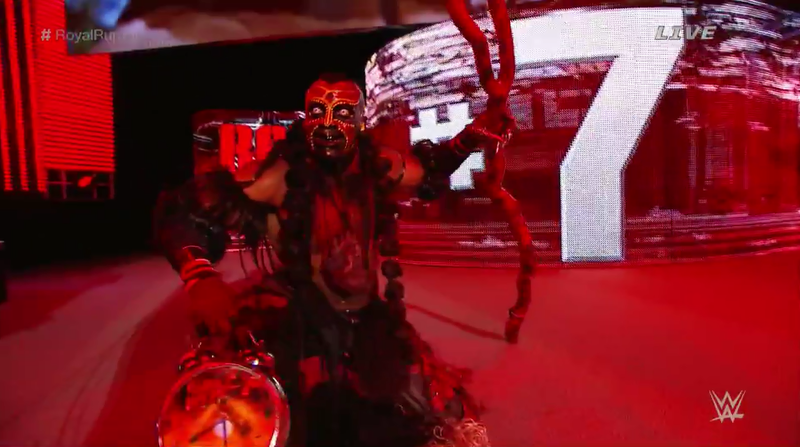 He showed some footage from the end of the rumble match and said that on Monday Night he was going to end the controversy with a huge announcement that would shake the foundations. When the match kicked off, The Big Show used his size to his advantage dropping some big punches to the midsection of Reigns. Every time Reigns tried to create some separation, The Big Show quickly ended it. At one point, Reigns gained some momentum hitting The Big Show with some big shots and he even clotheslined the giant to the outside and then we went to commercial break. Apparently, during the commercial break he knocked The Big Show out of the ring again, but when Show was in the ring, he hit Roman Reigns with a spear. 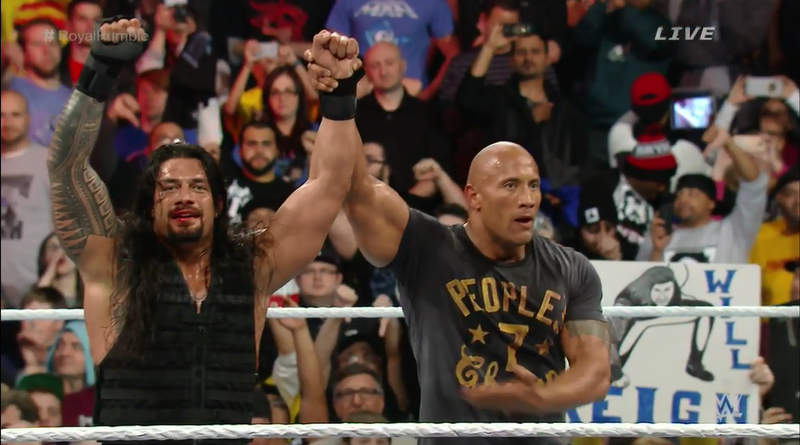 He then started attacking the leg of Reigns, but it wouldn’t be long until Reigns made his final run. After a flurry, he tried to go for a superman punch, but The Big Show caught him and delivered a chokeslam. 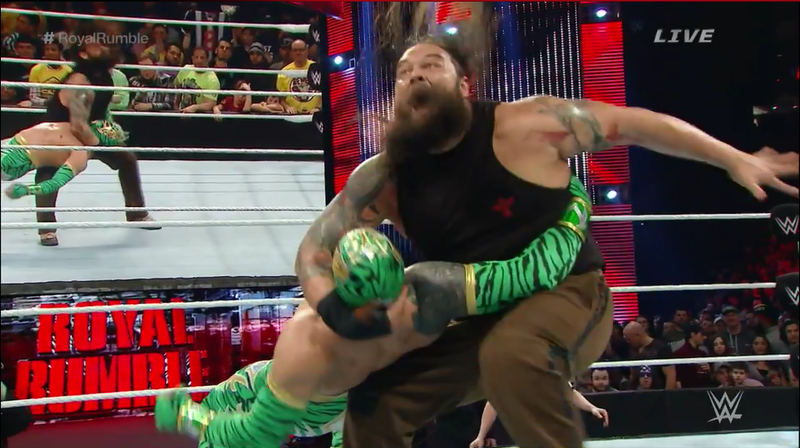 Reigns would kick out at two during the cover and The Big Show decided to go to the top rope. 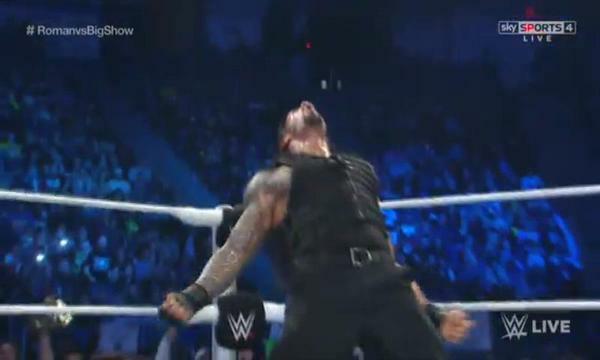 It would turn out to be a mistake as Reigns hit The Big Show with not one but two Superman punches which was followed with the spear for the win. The WWE revealed that Arnold Schwarzenegger was being inducted into the celebrity wing of the WWE Hall Of Fame. Then when the video was over, Seth Rollins came out with J&J Security boasting about how awesome he did at the Royal Rumble that he issued an open challenge to any superstar in the back and Ryback answered the challenge. 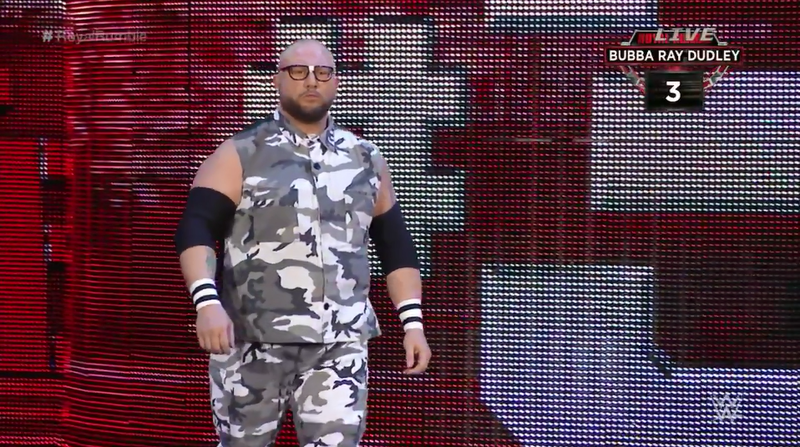 J&J Security attacked Ryback along with Rollins and then Erick Rowan came out and he took out J&J Security. Before he could get inside the ring, he received a kick from Rollins stopping him in his tracks. When Rollins went back to take care of Ryback, Dolph Ziggler’s music came on and he ran to the ring, but he didn’t fare well and it was back to Ryback. Ryback tried to deliver shell shock when Rollins returned, but J&J Security saved him once again. They ran to the back and after Kane cut a promo about the casket match he was having with Daniel Bryan. After that, we found out that The USOS were in action next. We found out that Tyson Kidd was in action with Jey Uso and for a while Tyson Kidd was in control of the match constantly working on the ankle of Jey Uso that he attacked. Jey tried to gain an advantage in the match with an impressive Samoan drop, but Tyson was too quick and too good and plus a distraction from Cesaro helped a lot as well. He would end up nailing a fisherman neckbreaker that sealed the deal and the win for Tyson Kidd. You have to be impressed with the team of Cesaro and Tyson Kidd. They are an exciting tag team and their getting the job done as the Brass Ring Club. 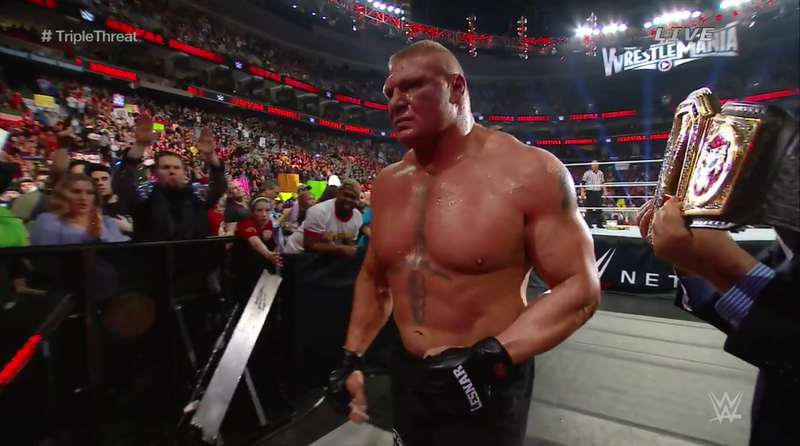 Rusev came out the ring and he was visibly pissed off at the fact that he feels that he should be facing Brock Lesnar at Wrestlemania 31. He was also pissed that he had to fight John Cena at Fast Lane. He claimed that Cena was old news, he had no desire, and that he was a loser. Then John Cena’s music came out and Cena delivered some thuganomics on Rusev and Lana. 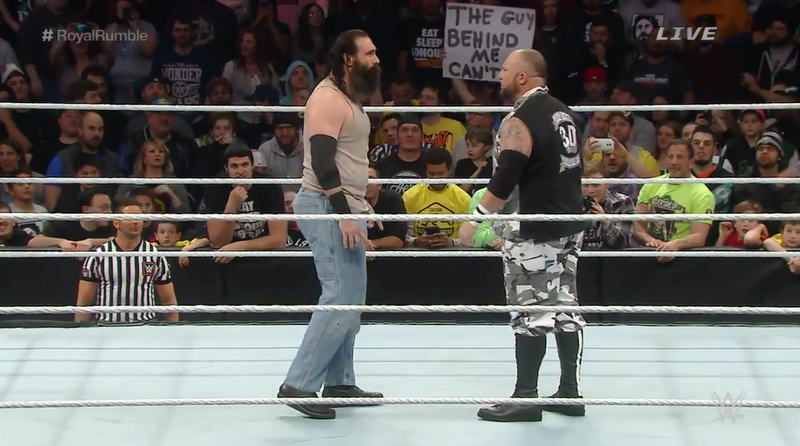 He then told Rusev that he wanted to fight, but Rusev backed out and left. We then found out that at WWE Fast Lane that Paige was going to go against Nikki Bella for the Divas Title. Then we cut to Renee Young who invites Paige for a quick interview, but that is interrupted right away by The Bella Twins who end up attacking Paige after they insult her. We then found out that Goldust and Stardust were in action against the newest tag team in the WWE The Ascension. The Ascension for the most part dominated the match taking it to Stardust who didn’t seem to be in the same page as Goldust. He was finally able to create some separation and he tagged his brother Goldust in who was on a roll. That wouldn’t last long as Stardust got a little selfish and he tagged himself into the match. Wrong move as The Ascension made quick work of Stardust, hitting him with the fall of man and the win. We saw R Truth and many others backstage with Wizard Wars man Justin Flom performing tricks with The Miz and Damien Mizdow. We then were treated to another brilliant promo from Bray Wyatt who may have revealed something to us for the future when he says that he is afraid of nothing alive or DEAD. Think about that for a second. The next match of the night was the casket match between Daniel Bryan and Corporate Kane. The match between the two was actual pretty even as both men were rbinging their best against each other. Kane was the first one to try and stick Daniel in the casket, but Daniel was able to punch his way out. After chopping down the leg of Kane like a tree with some impressive kicks, Daniel would try, but Kane was able to run out of the way before we went to commercial break. During the commercial break, Daniel continued to work on the new of Kane, but when he ran from one corner to try and hit Kane with his body, Kane moved out of the way. Kane was on the offensive as he tried to stick Daniel into the casket, but Daniel was resilient. Before we went to commercial break again, Kane came real close to stuffing Daniel in the casket. All he had to do was close it, but Daniel prevented that from happening. After going back and forth once again a million times, Daniel Bryan finally nailed Kane with the running knee and Kane went right into the casket and Daniel closed the lid for the win. This was a really good Smackdown, maybe they should go live more often. For most wrestling fans today, there is nothing strange about seeing women (or Divas as they are called today) in professional wrestling in this day and age. What if I told you that there was once a time when it wasn’t common place to see that? What if I told you that womens wrestling was banned in some of the states of this country? 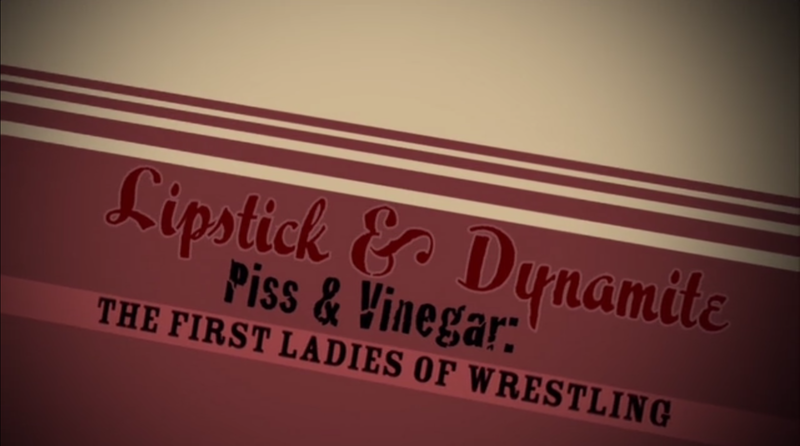 Well, it’s true and I decided to watch a documentary from Ruth Leitman called Lipstick & Dynamite, Piss & Vinegar: The First Ladies Of Wrestling for this week’s Wrestling Docs. The documentary follows the original women who broke the barrier in the sport of professional wrestling through testimony from the like of Fabulous Moolah, Ella Waldek, Mae Young, Gladys “Killem” Gillem, Rita Cortez-Lee, Ida May Martinez, Penny Banner, and so many more though some amazing archived footage like Classy Freddie Blassie, Captain Lou Albano, Mildred Burke, and so many more. 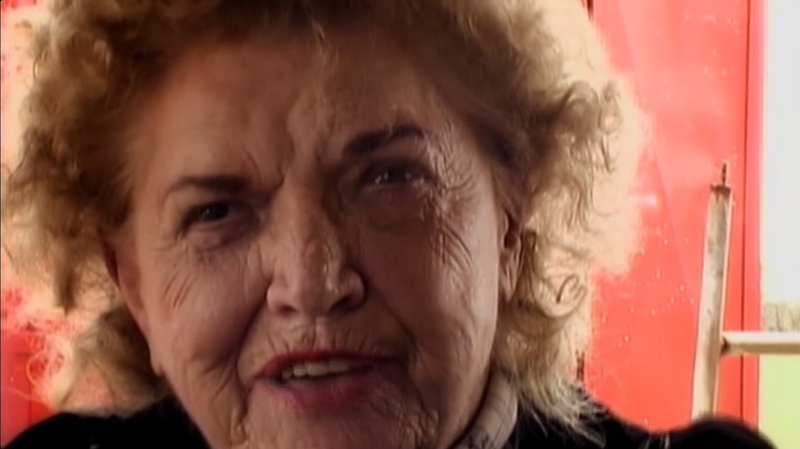 There is a lot of great footage of early women’s wrestling in this documentary and some great stories from the ones who paved the way for everyone else like the great and late Mae Young and the late Fabulous Moolah. It does seem however when you watch this doc, that you’ll figure out that Moolah was really liked by a lot of the girls. You’ll also find out how mistreated some of these ladies were by the male promoters in the business as well as learning about a lot of them like Billy Wolfe, Jack Pfefer, and so many more. These women sacrificed so much for the supermodel age that we are used to seeing today, but there is always a group that has to so that everyone else will benefit. The film also follows a lot of ladies who bicker about anything and a lot of them have issues with each other as I said before, but that doesn’t mean the stories aren’t cool to hear. I am going to give the documentary a B for a final grade. 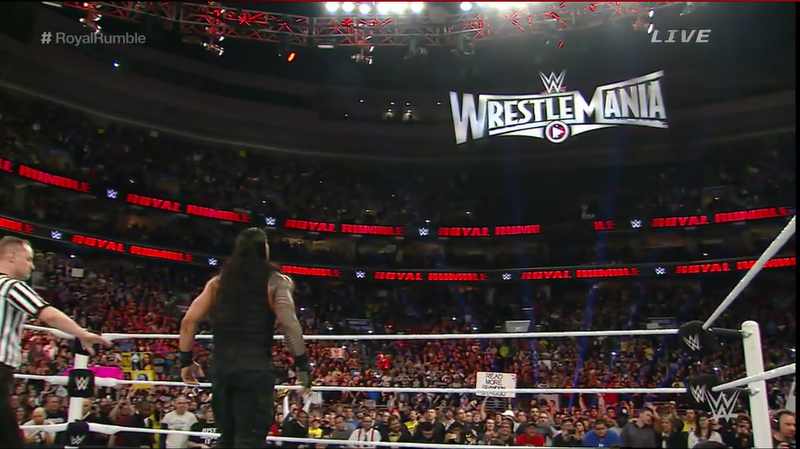 Roman Reigns won the Royal Rumble with Kane, The Big Show, and Rusev finishing in the final Four. Here is how they entered with their elimination, who they were eliminated by, time, and how many eliminations they had. 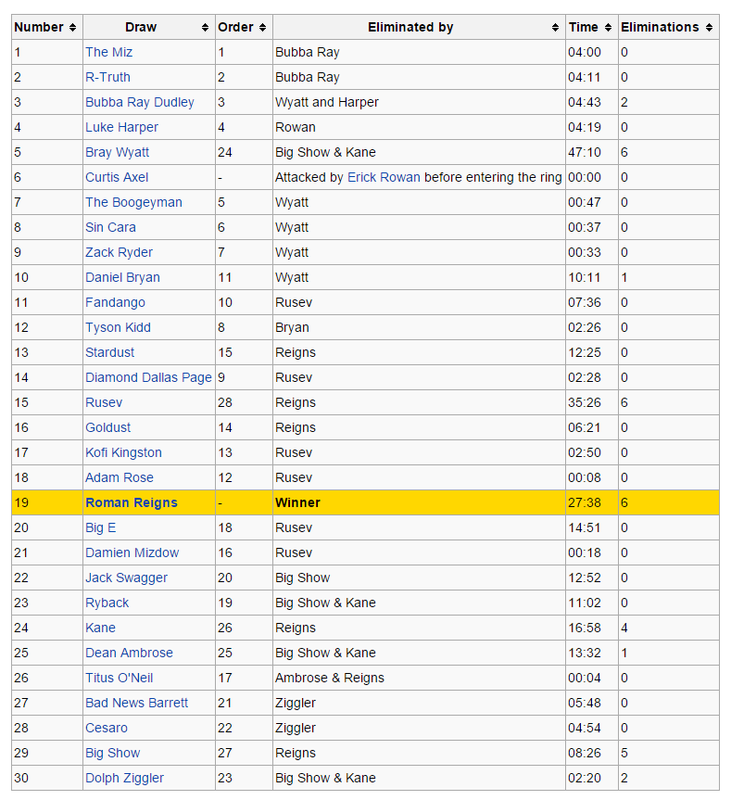 Randy Orton will win The Royal Rumble match with Roman Reigns and Daniel Bryan in the top 3. 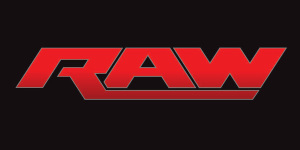 Considering that the WWE had the Raw Reunion special, I figures I would take a look at some legends of wrestling. This was one of the most legendary matches in the history of Texas Wrestling or WCCW (World Class Championship Wrestling) as King Kong Bundy was about to face the legend Fritz Von Erich, the patriarch of the Von Erich clan, for the last time in Cowboys Stadium in Dallas, Texas. King Kong Bundy was the NWA Heavyweight Championship and he was hand picked to fight Fritz in what would be Fritz’s retirement match. Bundy started the match by attacking Fritz when he wasn’t ready and he pounded on Fritz whose only defense was to try and slap on the iron claw from time to time. Fritz tried to fight back and even had Bundy on his back, but Bundy was 25 years old at the time of this match while Fritz was 53 years old which anyone can figure out that Bundy was going to be quicker even though he is heavy. Bundy would continue to attack Fritz using his size to his advantage even blocking the claw on an occasion, but he couldn’t keep Fritz down for too long. Fritz started to pound on Bundy with some big rights and lefts and even with some knees to the midsection. The match would eventually spill to the outside where Bundy was getting his head slammed into the steel posts. After the referee made the two men get back into the ring, Fritz slapped on the iron claw, but he was forced to break it since Bundy was against the ropes. The two ended up back on he outside where Fritz used a chair to whack Bundy over the head with. Then out of nowhere, Fritz goes for the pin on the endzone and he wins the match becoming the new NWA Champion. It’s rare to see someone win their last match, but I guess when you own the company you can do whatever you want. Some of you may remember Marc Mero, but that all depends on how long you have been following sports entertainment. I’ve been following it since I was a kid so I can remember exactly who Marc Mero is and who he was. I remember when he went by the name of Johnny B. Badd in WCW. I thought he was the Little Richard of wrestling and he was amazing. He would then move on to the WWE where he started out as The Wild Man Marc Mero to then just using his real name with the boxing gimmick during the attitude era and the name Marvelous Marc Mero. He was named Wrestling Observers Rookie Of The Year in 1991 and he has won the WCW Television Title and the WWE Intercontinental title. Marc was recently spotted delivering a heart felt speech to a bunch of middle school kids that brought me to tears. Marc started The Champion Of Choices program which is set up to help kids make the right choices in life whether it be to stop bullying or just by listening to the people that care. This quote from the website thinkpoz.org, better states what their mission is, “Positive choices are the key to the healthy development of America’s youth and lay the foundation to strengthen families and society. 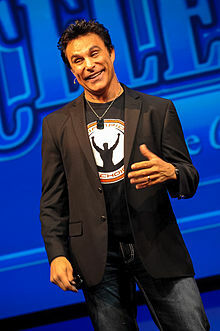 The goal of the Champion of Choices School Program is to provide a motivational learning experience for youth that builds positive life skills, improves school cultures, and strengthens family relationships.” I fully support what Marc Mero is doing now and you need to check out the video below because it will truly move you. For the full pic from Ashley Massaro, click here. Stay tuned here for more info if the rivalry of trying to stay relevant continues. Tonight was the debut of TNA Impact Wrestling on their new channel Destination America with the big main event seeing Bobby Roode defending his TNA Heavyweight Championship against Bobby Lashley in the rubber match. The episode started with a music video like sequence and then it had all the wrestlers in front of The Manhattan Center in New York. 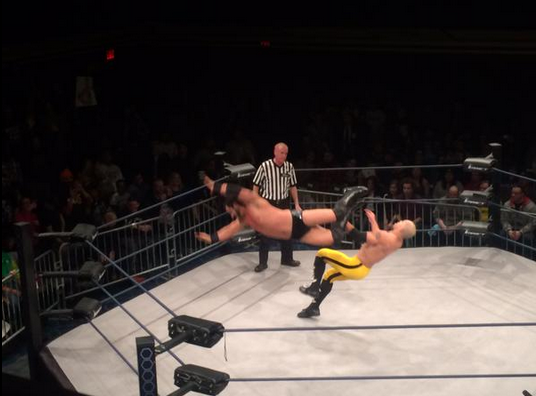 Right from the start, every wrestler and Knockout started to brawl all the way into the Manhattan Center. Kurt Angel came out and he announced that every title in TNA was on the line tonight. MVP came into the ring and he interrupted Kurt insulting him. Kurt grabs the mic and tells him that after he set the card for the night, he retired as Executive director of wrestling operations just to take on MVP in a street fight. Both men battled it out and MVO was throwing on some impressive submission moves, but it wasn’t enough as Kurt hit him with the Olympic slam for the win. Note: Josh Matthews is now an announcer on TNA. Ethan Carter cut a promo with Tyrus (the man formerly known as Broadus Clay) and Crazzy Steve. He basically called out Rockstar Spud and told him he was going to rip him apart. Then Mike Tenay had an interview with James Storm that was ok. The second match of the night was The Revolution (Storm and Abyss) defending their TNA Tag Team Titles against The Wolves (Eddie Edwards and Davey Richards). Then before the match started, The Hardy Boys came out to ringside and then they went to commercial. The Wolves absolutely dominated the match with their high risk maneuvers and by how creative they are in the ring. It wasn’t until ManiK and The Great Sanada interfered that the match changed. The duo came in and they started attacking the wolves and that is when the Hardy’s got involved. They cleared the ring of the two, but when Jeff saw Abyss go for the rope with the cowbell, he tried to grab it and in a tug of war with Abyss, he was flung into Eddie Edwards. When Edwards took the impact, James Storm took advantage and delivered the last call superkick for the win. The next segment of the night saw Jeremy Borash in the center of the ring. He was about to announce a special guest when Ethan Carter III interrupted him. Ethan interacted with the crowd for a little while and announced that he wanted to finish the job with Rockstar Spud. 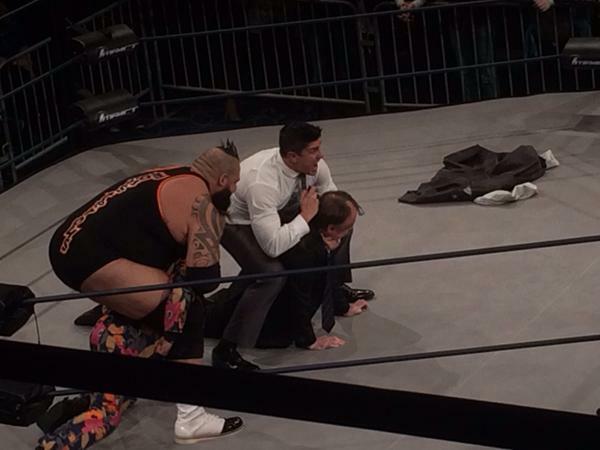 Then Tyrus showed up with Rockstar Spud and he threw him into the ring. Just when Ethan was about to shave Rockstar Spud’s hair, Jeremy got involved and stepped in between the two. Ethan told him to step back, but Jeremy slapped Ethan and the new target became Jeremy Borash. Ethan started shaving Jeremy’s head while Spud watched, but he didn’t shave the whole thing, just a little bit. The next match of the night saw Low KI defend his TNA X Division title against Austin Aries. These are matches that if you blink you might miss something and I can understand why the X-division is credited for building the company cause it’s awesome. Both of these guys threw everything they could at each other from martial arts moves from Low Ki to the physical nature of Austin Aries. Low Ki towards the end of the match thought he had Aries where he wanted him which was on the mat. Low Ki climbed the turnbuckle, but Aries was able to deliver a punishing kick to Low Ki. He then took Low Ki from the top and delivered his patented brain buster and he pinned him to become the TNA X-Division champion for the sixth time in his career. Before the Knockouts match, DJ Z was in the ring with Jesse Godderz and they announced the return of Robbie E was with Velvet Sky. The partcipants in the TNA Knockouts battle royal were Gail Kim, Rebel, Madison Rayne, Velvet Sky, Angelina Love, Jessika Havok, and TNA Knockouts Champion Taryn Terrell. The match was pretty decent and unlike the WWE the girls actually have to go over the top rope in order to be eliminated. Rebel was the first one eliminated and she was followed by in order Madison Rayne, Love, Sky, Gail Kim, and Havok was the last one eliminated by Terell. Havok was infuritated by the fact that she was eliminated that she attacked Terrell beating her senseless until the lights went out. 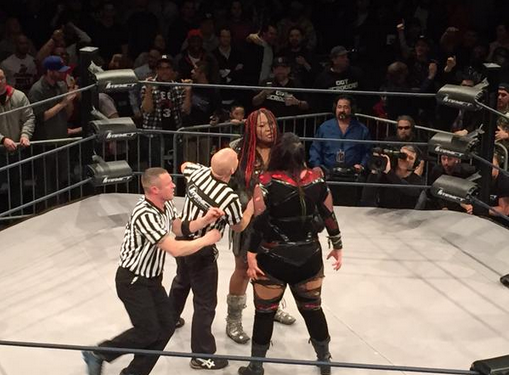 Then when the lights came on, Awesome Kong (Kharma in the WWE) was back in TNA and Havok backed down. The last match of the night saw Bobby Roode defend his TNA World Heavyweight Title against Bobby Roode in the third match of there series. Bobby started the match dominating Roode with some big impact moves, but Roode was quick to end the advantage to take one of his own that saw him bring the pain. He tried to end the match early with a crossface, but Lashley was able to reach the rope. After going back and forth with each other, Lashley and Roode ended up taking the fight to the outside. Just before we went to commercial break, They showed a video on the bottom of the screen of MVP and Kenny King with two masked men trying to get to the ring whiel Lashley had the advantage on Roode. When we came baack from break, Lashley was still dominating the match with some bear hugs as he tried to tire out Roode. Roode was able to get a quick set of offensive moves together and he tried to put him away with a running senton bomb, but Lashley would kick out of the pin attempt. Roode tried move after move, but Lashley would not give up and he kicked out of every pin attempt. 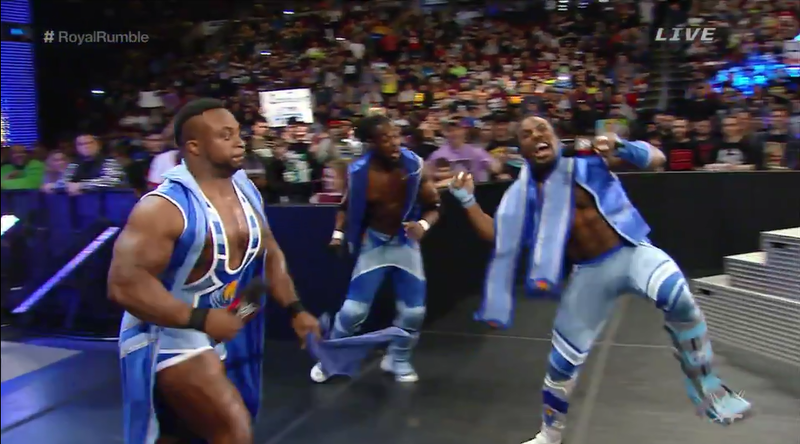 Eventually Kenny King and co would disrupt the match by pulling out the ref. The masked men revealed themselves to be Samoa Joe and Low Ki, but just as they were about to enter the ring, Eric Young ran into the ring as we assumed to help out Roode, but Eric turned on Roode and attacked him with a chair. 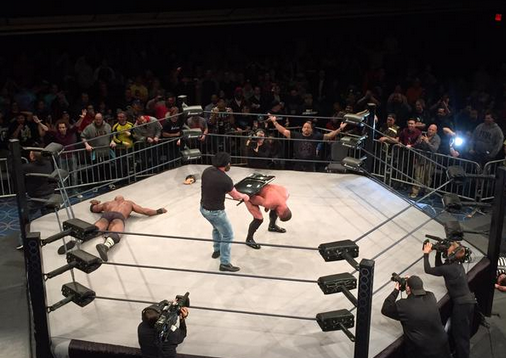 After everyone exited the ring, Lashley nailed Roode with the spear and covered him for the 1-2-3. He was the new TNA World Heavyweight Champion. 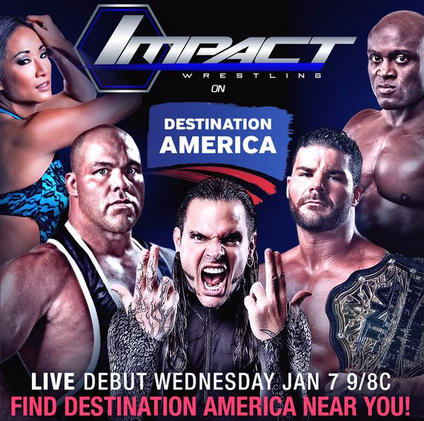 This was a great first night for TNA.